A Cavallo Entry Level Regular Hoof Boot. Cavallo Entry Level Hoof Boot's are really affordable and the ideal new starter hoof boot for beginner hoof booter's. The ideal entry level hoof boot for transitioning horses / horses new to barefoot, for use when boots are needed occasionally or simply as a spare tyre for a lost shoe. 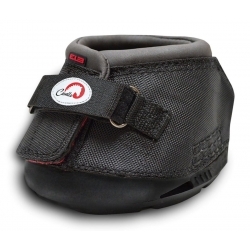 The Cavallo Entry Level hoof boot is ideal for therapeutic / rehabilitation needs too. The Cavallo Entry Level has the sames soles as the Cavallo Trek Hoof Boots but the Cavallo Trek has a more lightweight mesh upper. Which is more breathable and flexible so more ideal for longer usage or more cushioned and therefore more ideal for finer skinned horses or ponies. Cavallo Entry Level Regular features are as follows - See Additional Images! Suitable for: Ideal for horses with round or almost round shaped hooves. Can also work for horses with wider then long hooves. Horses with various hoof sizes and angles, covering short or longer distances. Ideal for pleasure riding, turn out and many other disciplines. Ideal for riders new to booting.